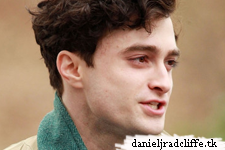 Home » Kill Your Darlings » Jack Huston: "KYD let's Daniel Radcliffe do what he's capable of doing"
Jack Huston: "KYD let's Daniel Radcliffe do what he's capable of doing"
Jack Huston talked with MTV news about Kill Your Darlings at the premiere of HBO's "Boardwalk Empire," and Jack called Daniel "the real deal." "I've never seen [anything like] the way he works, such tenacity," Huston said. "He's got a hunger for the craft. It was one of the loveliest experiences." Huston said that he understands the pressure Radcliffe faces moving forward in his career, but he thinks that people will be surprised when "Kill Your Darlings" comes out next year. "I think people are going to be shocked about how good he is," Huston said. "He's really coming into himself. It's very hard getting out of the shadow of something like 'Harry Potter' because... it's as big as it gets in the film world. I think he really wants to be considered the actor he's capable of actually becoming. I'm happy that I got to work with him and actually see him do what he's capable of doing."